I am totally convinced that I have written about this book. I waited months and months for it to be published. It was on my waiting list forever. How did I not post about it? I am here to rectify that over site. Largely, because Tasia Malakasis was featured in the new issue of Country Living. I said to myself, Self, you love that book and you did a great post. But I looked and couldn't find it. I am going crazy!! Malakasis has a great story. In this great migration back to the farm era, she was a forerunner. Here is the the Cliff Notes version. Small town Alabama girl makes it big in NYC. She goes into her local cheese shop and finds a chèvre from Alabama. Harasses the cheesemaker till they let her intern at the dairy. Buys the dairy and moves back to Alabama. 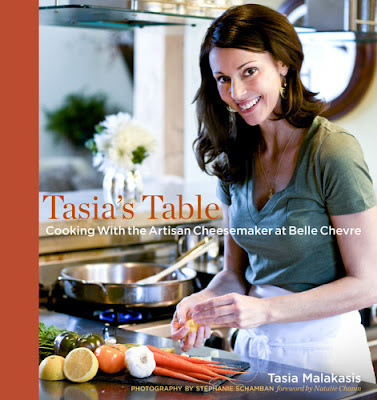 Malakasis is Greek but also Southern and with lots of goat cheese around, she has managed to write a cookbook that encompasses all the parts of her life. There is a recipe for moussaka right along side a recipe for grits and goat cheese. While the recipes rely on a lot of Belle Chèvre, there is a definite Southern breeze flowing through them. If you have ever complained that all Southern cookbooks are basically alike, this is one that will change your view. Take the sideboard staple, potato salad. Here it becomes a warm and unctuous side. It looks like potato salad but with a classy twist. Steam potatoes until tender. Drain and toss with with wine, salt and pepper. Add cheese, onion, and parsley. Stir together remaining ingredients. Toss with potatoes and serve immediately. To read more about the Country Living article, head over to Lucindaville.